US Defence Secretary Jim Mattis is optimistic about improving military ties with Egypt after talks in Cairo with President Abdel Fattah al-Sisi, following a period of strain under the Obama administration. Earlier this month President Donald Trump moved to reset US relations with Egypt, hosting Sisi for talks at the White House and giving him firm backing, including in the fight against Islamist militants. “I left Cairo confident, very confident in the avenues we have to advance our military-to-military relationship, which has been a bedrock and has stood solid all these years,” Mattis told reporters in Tel Aviv, without elaborating. 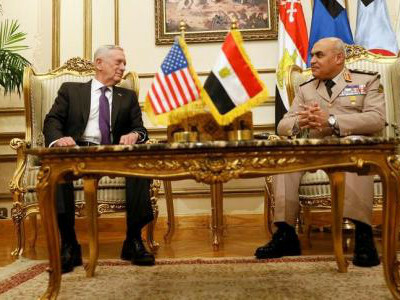 A US defence official said Mattis’ meetings with Sisi and Egypt’s defence minister focused on building trust to allow for stronger military ties. Trump’s predecessor froze aid to Egypt for two years after Sisi, then a general, overthrew President Mohamed Mursi in mid-2013 after mass protests against Mursi’s rule. Mursi, a Muslim Brotherhood member, was elected the previous year. The Trump administration proposes massive cuts to US foreign aid, but has indicated Egypt will continue to receive its $1.3 billion worth of annual military aid. Mattis is the first Trump administration cabinet level official to visit Egypt. A statement from Sisi’s office said Egypt was keen “on advancing bilateral relations under the new American administration”.